This 2017 file photo shows solar panels installed at Tucson facilities. Tom Steyer and his NextGen Climate Action group spent at least $22.5 million on Prop. 127, a clean-energy initiative that was voted down Tuesday. Tom Steyer has put us in a dilemma. The California billionaire, who was in Tucson last weekend, is putting the money behind the clean-energy initiative that may be on the ballot in November. If it’s passed, Arizona utilities would have to get 50 percent of their energy from renewable sources by 2030. Abstractly, it’s a laudable goal, but opponents are right to say we should think carefully before amending the state constitution using the hedge-fund veteran’s template. On the other hand, though, we have Arizona Public Service and its parent company, Pinnacle West. The monopoly that has corrupted Arizona through its covert and overt spending on politics seems to be the force fighting the initiative before it’s even been approved for the ballot. And one thing we can be sure about with APS is that the company will do what it takes to keep its huge profits and handsome executive compensation intact. Last year the utility’s parent company, Pinnacle West, made a profit of $488.5 million. CEO Don Brandt’s total compensation was in the neighborhood of $10 million. These Arizona millionaires aren’t going to let a California billionaire harm their interests. But what’s in our interest? That’s a tougher problem to solve, and one that we’ll all be working at for the next few months if the initiative makes the ballot. I interviewed Steyer on Saturday, between his speech to the executive committee of the Arizona Democratic Party and the party’s annual Udall Dinner, but before I get to that, let me tell you what a less diabolical Arizona utility than APS has to say about the initiative — our own Tucson Electric Power. Joe Salkowski, TEP’s chief spokesman, said the utility is not taking a formal position on the initiative. But the company’s forecasters have taken a stab at the initiative’s effects if it were to pass. Basically, energy would cost more —at least $500 per year more for an average residential customer, the company estimates. The reason: If the initiative passes, TEP will have to spend more on new solar plants, new storage capacity and new incentives for rooftop solar while still paying for existing plants. Salkowski would prefer these decisions be hashed out at the Arizona Corporation Commission, where, he noted, two members are up for election this year and a new energy-modernization plan is already being debated. “The initiative process does not allow for a conversation. It is a mandate imposed without consideration of what individual utilities are doing and what individual communities are able to pay for,” he said. 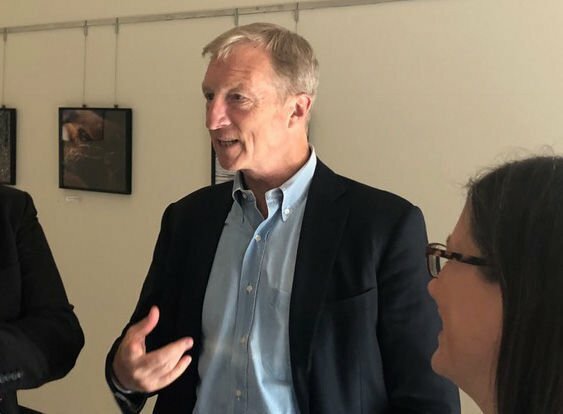 Steyer, not surprisingly, was enthusiastic, if a bit under-informed, when I asked him about the initiative he is fronting through the group he formed, NextGen America. I pressed him on the question of nuclear energy. The Palo Verde plant near Gila Bend is the state’s largest energy producer and is emissions-free, though of course it produces nuclear waste. Initiative opponents have argued the plant would have to be closed if it passes, because so much solar power would have to be brought on the grid and used during daytimes that it would make Palo Verde’s power unusable. At best, APS would have to pay other states to take it. But he pointed out that Palo Verde’s power could easily fit within the portion permitted under the new initiative for non-renewable energy. “People are looking for reasons that things are hard. It’s not that there aren’t technical issues. But these people will always go, ‘It’s so hard,’” he said. One of the more peculiar aspects of the initiative is that it doesn’t just require increasing proportions of the state’s energy to be from renewables, but that it also requires a certain percentage of that to be from rooftop solar. By 2030, 10 percent of a utility’s retail energy must be produced by this “distributed generation” of power. It looks to me like a sop to the rooftop solar industry. When I asked Steyer about it, he wasn’t sure why that was included. After consulting with an assistant, he said: “One of the reasons for the distributed generation is it’s a way to get more clean energy, to have distributed be part of the solar. APS, of course, led the fight to reduce compensation for people with rooftop solar, which was the issue that drew its big money into state politics. And it continues to be a major supporter of strictly GOP candidates. So, while the ramifications of Steyer’s initiative are worrying, you can’t ignore the self-interest that our dominant in-state powers are pursuing, either. They have $488 million reasons to fight. This is the written version of the speech Tom Steyer delivered to the Udall Dinner in Tucson on May 19, 2018.